Ordered that Locky Allen be appointed overseer of the road from the fork near Jesse Smitherman to the fork of the road near Daniel McIvers and have the following hands to work: Duncan P. Leach, Rheubin Allen and hands, Eli Smith, Raleigh S. Allen, Nich Nawls, Emsley More, Bennet Owens, Isaac Stutts and Kenneth McCaskill. Ordered that Eli R. Sowell be appointed overseer of the Island Ford road from the northwest end of E.Q. Sowell's lane to the Salem Road near Alexr. Kellys and work the following hands: J.L. Sowell, Ruvin Simmons, Carney Fields, Josiah T. Phillips, Hugh Moore, Love Simmons, Samuel W. Sowell, John H. McLemore, Henry Moore, Emsley Moore, Jackson Crabtree and Ganey Simmons. Emsley D. Moore's family is listed in the 1860 and 1870 Moore County census, Ritter Township. During this time he lived near Pleasant Hill United Methodist Church and behind what is now North Moore School. His house was near Ann Elizabeth Maness' parents home. In the 1860 Federal Census, he was a farmerand owned his own land, post office, Gold Region, Ritter Township, Moore County, NC. In the 1870 Federal Census, occupation, farmer, owned his farm, post office, Carters Mill. 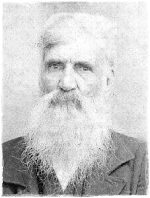 During the Civil War, he and his brother-in-law, Thomas Maness were "Outlyers" and many interesting stories have been handed down and have been recorded in Maness history. His family is listed in the 1880 Chatham County census in Bear Creek Township. In the 1880 census, he is 53 years old, farmer, married, head of household and his mother and father were born in North Carolina. He bought a 62 acre tract of land on Tyson Creek, February 23, 1884. He was still listed in Bear Creek Township in the 1900 census, his nickname was Em. The 1910 census listed him living with his son, IsaaceLendon Moore and his wife, Annie (Ann) living with their daughter, Alice (Margaret Alice Moore) Scott. He apparently died before death certificates came into being during 1913. Annie's (Ann) death certificate dated May 07, 1914,listed her as a widow. The information for this certificate was given by her son-in-law Em Scott, indicating she lived with them until her death.